The Top 5 Things I WON’T Be Buying This Christmas! On November 22nd, I drove past my friend Katie’s house, only to discover her Christmas decorations were out in full force. Flashing light things, inflatable Santa- the works. Alarmed, I contacted her to advise her of this startling November development. She assured me she was not only aware but that Christmas decorations had intentionally arrived prematurely. Her outstanding organisation skills have prompted me to get my shiz together shop on. I bought a new box of baubles for the tree, picked up a few bits and pieces for the big kids then wandered through aisles of toys and books looking for things for my two year old before deciding that a nice coffee would make me feel less overwhelmed. Thus caffeinated, I went home to access the saviour of all reluctant shoppers- the Internet. As a kid, these were highly sought after. Much as I loved them, I’m reluctant to shell out fifty bucks for one. So the search continued. While I found plenty of gift ideas, I also came across a swathe of things I’d never buy. So here they are. The Top 5 countdown of items I will NOT be buying this Christmas! 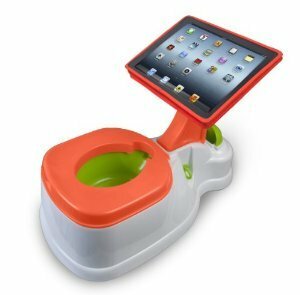 This is a potty with an in-built iPad holder. Toilet training is on the horizon for Miss 2, but toileting and technology don’t need to go hand-in-hand. I want my child to be happy enough to go to the loo without the need or even the desire for electronic entertainment! Feed and walk your little pup, if he makes a mess you clean it up! When you squeeze his leash he makes a gassy sound that gets louder and louder until…plop. The first to clean up after the dog three times wins. 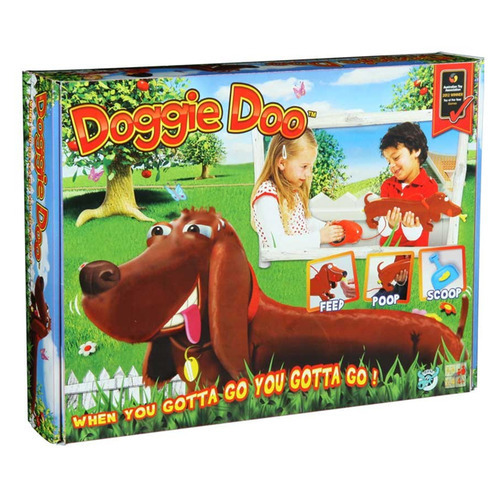 A game that encourages poop play is not welcome in my house. 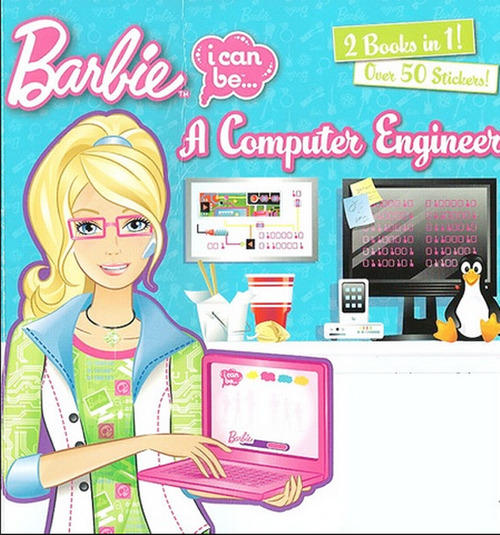 The premise of this book is that Barbie is working on a new computer game. She laughingly explains to Skipper that she is working on the premise of the game, but will need to seek male assistance to turn it into an actual game. Soon after, disaster strikes. Barbie’s computer is infected with a virus! She also unwittingly infects Skipper’s computer by using the same heart-shaped USB (that doubles as a necklace charm) that she’d used in hers. Luckily, Steven and Brian save the day, reminding us once again that we ladies can be whatever we want to be if we have good men around to do all the tricksy bits. The book came out a few years ago but has fortunately been taken off the shelves once it came to the attention of writer Pamela Ribon who gave an awesome blow-by-blow account of the “story” that is quite literally dripping with sexist stereotypes and inanity. It’s safe to say that this one is not going to be filling a stocking at our house! It wears a nappy (diaper) and comes with a bottle and a bracelet. The idea is that you feed it a bottle of water and instead of the predictable wet nappy (art imitating life, as it were) you press it’s belly button (just like in real life) and POP! It poops out a charm to go on your new bracelet. 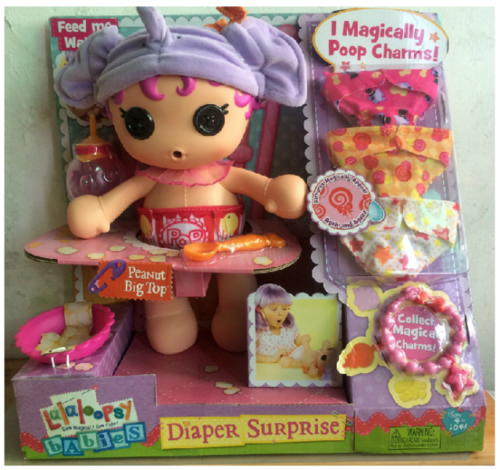 Check out the top right of the box: I Magically Poop Charms! Firstly, I doubt it’s magical. Pooping anything that isn’t poop does not sound magical. It sounds wrong. Secondly, does anyone want jewellery that has been pooped out of anyone or anything? Thirdly, I don’t want to encourage my 2 year old to go fishing in her nappy for “charms”! This tops my list of stuff I’m NOT buying EVER. It looks kind of like a yellow flower or maybe a cartoonish sun. But it is not. 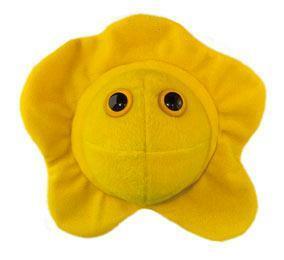 This is a plush version of Herpes Simplex Type 2. In layman’s terms: Genital Herpes. 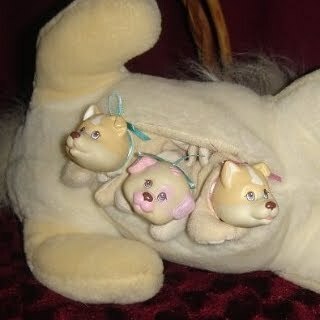 These cheery looking plush toys seem to be primarily a gag gift or a teaching tool. Microbes made in soft-toy form, over a million times their actual size and in cheery colours would be very appealing for little kids. The company that makes them also offers a number of other microbes like chlamydia and e-coli. There is even a page on their website with suggest microbe gifts for girlfriends and boyfriends that include a plush sperm and a cuddly Epstein-Barr microbe. I’m a big believer in kids knowing the proper name for things but there’s no way I want an upset kid in a shopping centre, crying because “Mummy forgot my herpes!” I can just imagine! Anything not hitting your shopping trolley this festive season? Linking up for Laugh Link!